Angel Therapy: Healing Messages for Every Area of Your Life, is by Doreen Virtue, Ph.D., bestselling author of Losing Your Pounds of Pain, Constant Craving, The Yo-Yo Diet Syndrome, The Lightworker's Way, and much more. 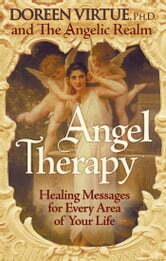 Angel Therapy is a two-part book. The first part is set up in an A-to-Z subject format, with the second part being a step-by step guide on "how to communicate with your angels." In Angel Therapy, you will learn new ways of looking at, and fresh ways of handling issues and common problems such as addictions, breakups, children, sleep, worry, and many more!